At 310 metres long, these two catenaries for the Special Olympics 2011 Summer Games were 100 metres longer than any we have previously installed. 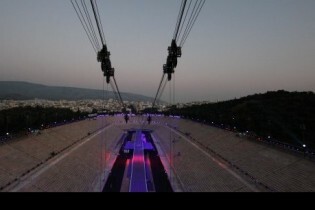 Running the length of Greece’s Panathenaic Stadium, the flying system was designed to take a working load of 1600kg with each of the two cables providing two independently controlled carriage units able to travel at a speed of 4m/s. The load included three scenic items provided by ourselves: a 16 metre high concertinaed figure of Poseidon; a 15 metre stylised rendition of his son Polyphemus; and an 8 metre long, 300kg sculptural ‘Chariot of the Sun’. We installed a 15 metre tower at one end of the arena and a 45 metre tower at the other end – the height difference compensating for the 30 metre change in level between the closed end of the arena which is built into the Athens’ hillside, and the open end which lies at street level. As with any flying system we install, the ability to fully monitor and control the system are vital. Monitoring includes not just the system itself, but any external influences that could affect performance – the most usual and unfortunately the most willful of which is the weather. We always install numerous weather stations to feed us accurate information on local conditions which in this case, with such a long catenary, in such an exposed location, along with the regular occurrence of electrical storms, lead us to re-schedule all test flights to be carried out at night when conditions were considerably calmer.